The best saddle I have tried for the strida in terms of comfort and ergonomycs is the Velo Newport S4. Impressive! Absolutly fantastic. If you try it you will never come back to the original. I own two stridas, one with the original Velo, and the other one with the Velo Newport S4. When I must ride the original Velo, I hate to ride. When I ride the Newport, I am in the heaven. The Newport S4 must be an option from the factory. mtths wrote: But original saddle of Strida is ... Velo. See the bottom of saddle. Not easy to see but there is Velo brand. I have Strida 5.2. Maybe for other older types or other production lots other subvendors were choosen. Sliding to front is rather being unskilled to ride. I had exactly the same problem for few first weeks of riding. Now I sit properly most of riding time. On the first days I also thought that Strida standard saddle is not very comfortable. And I started to look for other but I couldn't decide (all saddles with good opinions were expensive) after more than 1 month I get accustomed to standard saddle. Maybe is not the best but anyway better than saddles types designed for mountain bicycles. In the UK, I went to my local Halfords, and tried fitting various seats, and cycling round the store to get a feel (!?) for comfort. In hindsight, the flat lino floor of the shop is not a good test of behaviour vs. potholes!! I settled on a gel-filled one from Bikehut. But after reading the reports here, I'm thinking of going back and trying some sprung saddles. Gel is good at distributing the load evenly, no question. And has at least some elastic impact dampening. p.s. : The creme version with the Brooks saddle and bag? That is too steampunk-awesome to even exist. Really lovely! (My Strida 3 is a visual assault, with green mudguards, and yellow reflecto-tape plastered everywhere.. I recently added a Brooks Flyer Special to my Strida 5.0 LT. Love it! More comfortable than stock and the springs seem to really soak up many of the bumps. Along with it I added the bended bars which for me, whose 6'2" tall, was a big improvement in fit and general feeling of stability. I choose the aged leather seat to avoid having to oil the seat and because my seat will rarely see long term sun exposure or inclement weather (here in California). I had a bit of a struggle getting the seats mounting rails to snap onto the plastic Strida seat bracket. I had to push and wiggle for 20 minutes before it finally slipped on. Once in place the seat frame fit well without any clearance issues. 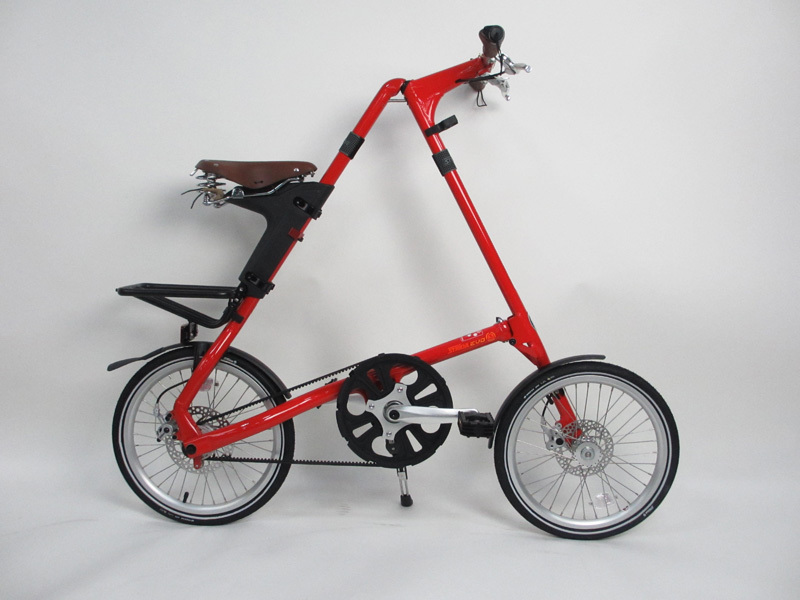 I am about to purchase a flyer aged myself, looks very nice on your strida! When you say "Brooks Flyer Special" Do you mean a Brooks Flyer S? S being a shorter (ladies) version. I ask because I was thinking if I should get the S or not, perhaps the normal one would be a bit too large on a Strida? I think the S comes in at about 245mm V's 275mm for the standard. Elliott wrote: I recently added a Brooks Flyer Special to my Strida 5.0 LT. Love it! More comfortable than stock and the springs seem to really soak up many of the bumps. Along with it I added the bended bars which for me, whose 6'2" tall, was a big improvement in fit and general feeling of stability. Brooks Flyer Speical ≠ Brooks Flyer S.
My confusion was the OP mentioned it was a special. It is not, it is just a Brooks Flyer Aged. The Brooks Flyer S Aged has less holes where the laces go through. Well I've just ordered a (non S) Brooks Flyer Aged, after a measure up, and looking at the picture above it looks a great fit for the strida. Thanks for your help. I have a SX Strida for almost a year and the 1st thing I have done was to put in a more confortable saddle (a selle royal). 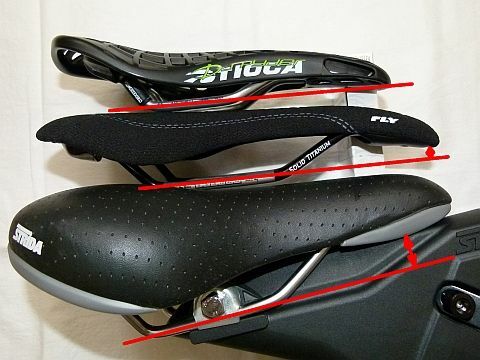 The saddle is good but the position is not entirely horizontal so I keep looking for the ideal saddle. My thougts are with the Brooks 67 and now the strida ST-SDL-003. Can anyone give informations about these sadlles (comfort and horizontality)? Thanks. "The crucial factor whether a saddle fits on the molding or not is the distance of the saddle rails to the the lower edge of the saddle nose, as you can see below." is originally equipped with the ST-SDL-003 leather saddle. Looks like the Strida saddle would fit, no? Perhaps could Bill tell us more? When I first saw this post I began to think how I can help, Blackstridaaustria is just too fast. I will take some photos today with the Strida leather saddle mounted on a bike with a level across the top of the saddle. I have been using the Strida leather saddle this summer and have been enjoying the ride. I have never ridden a Brooks so I can't compare. I like the springs in the back of the saddle as it takes the edge off of the bumps on rough pavement. The Strida leather saddle is also wider at the back than the other Strida saddles and as I am sitting more upright on the Strida than other bikes the wider seat at the back of the saddle gives me more support. I have several customers using this saddle including women with no complaints. I have put about 500 km on the saddle myself which have included rides up to one and a half hours and 35 km. 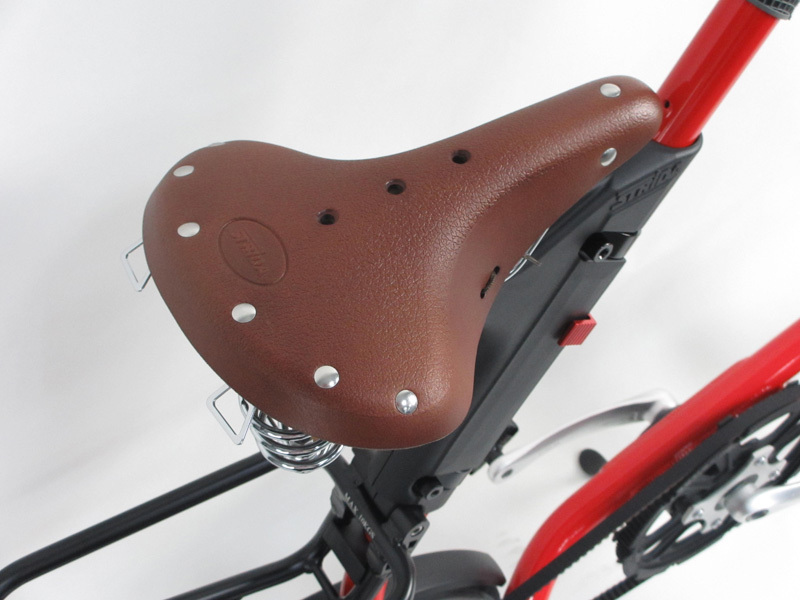 I am out of stock until my next order comes late this month, or I could send anyone a Strida leather saddle complete with a bike as I have those in stock! All this talk of the Brooks Flyer but I think the B67 is better and costs the same. I say get the widest saddle possible since you are sitting almost vertical on this bike. I got a Brooks B67 Select, it is awesome. Flyer is not as wide, so less comfy. The Strida springer looks good too, since it is more like a B67. Anyone know how wide it is?